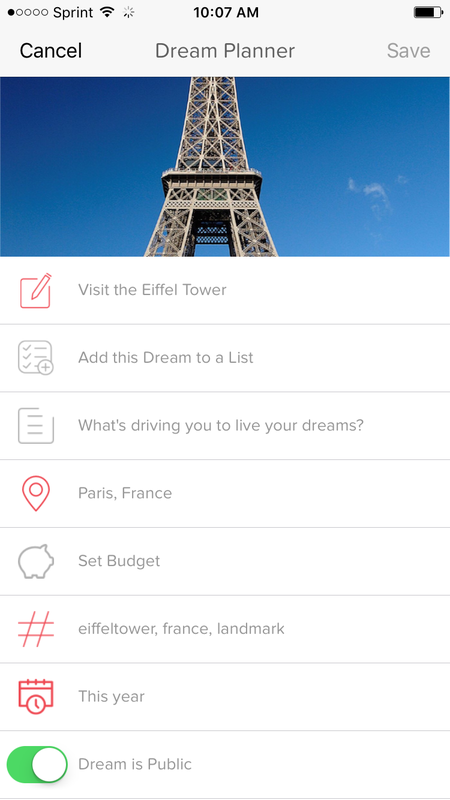 BUCKiTDREAM is a dream platform that allows you to create bucket list dreams and then plan out all the things you need to do in order to make them a reality. The company has now raised $4.5 million. We all have a bucket list of the things we want to do and see before we kick the bucket and go to that great server room in the sky. Unfortunately, most of our dreams, although entirely attainable with the right plan and perseverance, never become reality. BUCKiTDREAM is “a dream platform” that just raised another $1 million (bringing their total funding to $4.5M), and it’s thinking that with some planning tools and a little social incentive, it can help people convert their inspiration to execution. 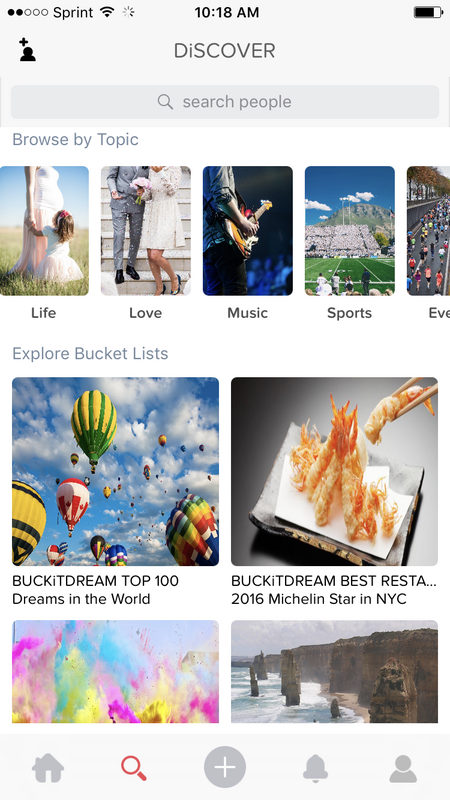 BUCKiTDREAM offers a web/iOS/Android application that allows you to create specific personal bucket list dreams (trips, concerts, interactions, etc.) and then use some out-of-the-box organization tools to lay out the concrete steps necessary to fulfill those dreams. It also features social functions that allow you to follow the dreams of others so that you are inspired, and perhaps further incentivized, to pursue your own dreams. For example, I dream of someday visiting the Eiffel Tower. On the BUCKiTDREAM app, I create something of a profile for that dream. Once the main goal is set up, I then add budget, desired completion date, the motivation behind the dream, and any other items necessary to convert the dream into a reality; quitting my job, taking up smoking, learning to paint, whatever. As mentioned before, the dream could be private, or it could be public for all BUCKiTDREAM users to see, or all my social media connections to see. Essentially, the app allows me to turn dreams into actionable goals with a concrete set of completion steps. Going outside of standard travel ambitions, you can add your own custom dreams to your bucket list—like skydiving in a Speedo for instance—select from the vast library of BUCKiTDREAM curated dreams (tough to dream up a way to monetize this option, isn’t it? ), or actually add the dreams of others to your own lists. 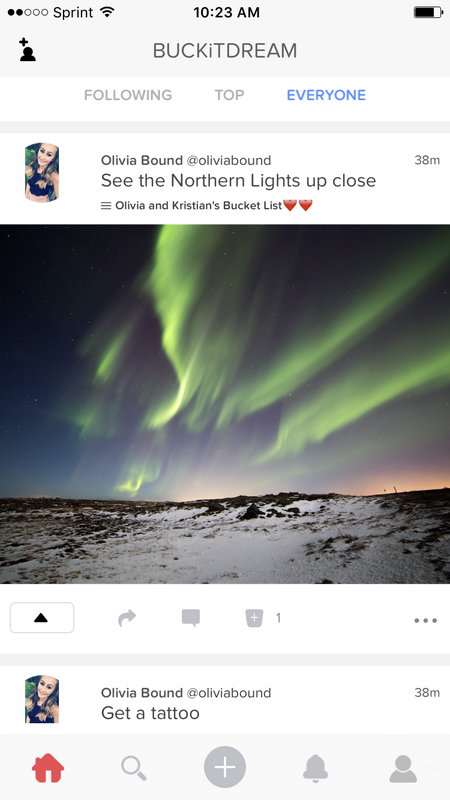 The app also features a social feed that allows you to see the bucket lists of other users you have decided to “follow,” the top overall dreams in the app (based on upvotes), and the dreams of everyone using the app. In terms of actually assisting in the execution, BUCKiTDREAM doesn’t really go there as an app, though through a few campaigns, they have given away some money and free travel to help users finance dreams and excursions. As one of their promotional videos states, “It’s not a magic ticket; it’s a mindset.” Beyond some warm and fuzzies, at the end of the day, the app is nothing special. Apps like iWish offer similar features and there’s nothing particularly groundbreaking about the design. Nevertheless, BUCKiTDREAM has garnered some significant publicity through influencer campaigns and marketing partnerships with moguls like Ellen Degeneres and Richard Branson. People are creating 10, 20 or 100 dreams, and these dreams are not fuzzy; they’re very specific future intention data and that’s attracting big interest from US media, brands and merchants. Our ultimate destination is to build out a platform that connects dreamers with merchants. And in that statement, we have the real beauty of this platform. Where there are 100,000 “dreamers”— most of them dreaming about travel-related events—there is already loads of very attractive data. BUCKiTDREAM clearly plans on using that data to connect dreamers directly with brands and advertisers. Granted, it will likely be brands and advertisers that have the goods and services suitable for the goal of dream realization. Returning to my Eiffel Tower dream: in order to make that a reality, I’ll need a flight (cue Expedia ad); I’ll need a hotel or hostel (cue Bookings.com or Hilton ad); and the same goes for all the other implicit and explicit facets of my dream—restaurants, bus tours, you name it. Because users are creating such specific data, BUCKiTDREAM can and will serve them highly targeted offers. As far as ad-based revenue models go, this platform certainly is a dream come true. Although the company is based in Melbourne, they’ve worked hard to crack the U.S. market, filming numerous promo videos based in the U.S. and gearing their content to that audience. In fact, as soon as I opened the app, I was given a video showing numerous U.S. citizens discussing why they’d like to visit Australia. Currently, the app does not contain ads, but you can expect that to change soon (take a look at their “curated” Facebook posts). They have a proven platform, a small but engaged user base, and as of last week, more money. But while BUCKiTDREAM has their own dreams, along the way to those, if through nothing more than constant reminders and bite-sized strategy, they’ll undoubtedly help facilitate the bucket list dreams of a number of their users. And that’s great. Hopefully, one of those users will be me. Well, if the system is proven and you have a few million behind you to work with, lets hope they put something together that is worth using for the long term. That kind of money will get you to go places in a hurry! Some of us have a good list going, but the same people need a little boost to get the bucket list accomplished. This looks like it will help with that. Very cool! I am one of those people. I always have a list in my head and never seem to be motivated enough to get something checked off it. This might help, right?